from SHESTO handle all sorts of craft, hobby & DIY jobs! Digital & Dial Calipers. MODELCRAFT’s units blend clear read-outs with easy operation for optimal accuracy. The Stainless Steel Digital Caliper [PGA1100] sports a generous 100 mm (4") jaw, clear LCD display, 4-way measurement in 0.01 mm increments, true mm-inch conversion, locking screw and 1.5V power battery – all in a padded, protective case. Matchless precision, quality and convenience! Rulers & Tape Measures. These versatile SHESTO versatile devices fit neatly into tool bags, pockets and pouches. The handy “Flexi” Steel Rule [PRU1006] offers compact 150 mm (6") design, mm-inch gradients and rugged stainless steel construction. Flip it over for a useful conversion table. Superb for spot measurements! Squares & Levels. Check 90? joints, joins and levels with matchless precision. MODELCRAFT Engineers Squares sport solid steel construction and hardened, tempered, finely polished blades manufactured to government standards. Available in 4 sizes – 25 mm (1") [PSQ2210/1], 50 mm (2") [PSQ2210/2], 75 mm (3") [PSQ2210/3] and 100 mm (4") [PSQ2210/4]. Great for wood-working and model-building! Punches & Scribers. Accurately pierce and score a wide range of surfaces and substrates with these reliable devices. The MODELCRAFT Carbide Point Scriber [PSB0800] features a fully retractable, replaceable tungsten carbide tip for maximum precision – and a pocket clip for easy carrying. The unique stop point also helps prevent the carbide point from falling out. Terrific for craft & hobby projects! Depth Gauges. Precisely probe and gauge cavities with these handy MODELCRAFT tools. The versatile Depth Gauge With Protractor [PGA6502] accurately assesses openings at angles other than 90?. The handy device also features metric-inch scales – and a spring tension nut for quick, easy depth measurements. And don’t forget mechanical options, either. SHESTO’s rugged, precise Dividers and Calipers offer excellent operating economy. 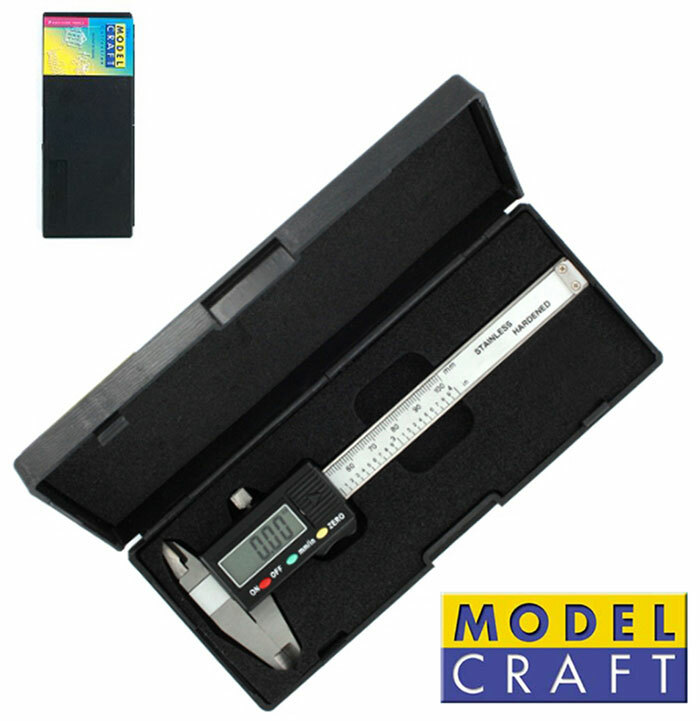 The traditional MODELCRAFT Micrometer [PGA5024] combines engineering-grade accuracy with a 0-25 mm sweep in 0.02 mm increments for excellent value, quality and performance!